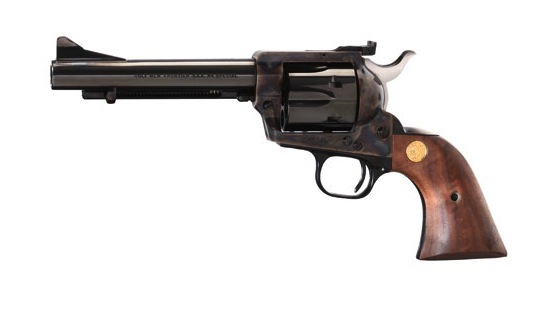 Three of the newest single actions are Colt's reintroduced New Frontier, Ruger's brand-new Single-Ten, and Uberti's 1873 Cattleman El Patron Cowboy Mounted Shooter model. Like the original Colt New Frontier, the 2011 model comes with an adjustable rear sight. Other features include a ramped front sight, blue/case-colored finish, and walnut grips. Optional barrel lengths are 4.75, 5.5, and 7.5 inches. Available calibers include .357 Mag., .44 Spl., and .45 Colt. Price: $1,455. Ruger's .22 LR stainless-steel Single-Ten comes with a 10-shot cylinder, 5.5-inch barrel, Williams fiber-optic adjustable sights, and smooth walnut Gunfighter grips. Price: $619. Uberti's El Patron Cowboy Mounted Shooter is chambered for .357 Mag. or .45 Colt, comes with a 3.5- or 4-inch barrel, and features a lower hammer profile and Wolff springs. Finish is blue/casehardened or stainless steel, and grips are walnut. Price: $599 (blue/casehardened) or $749 (stainless steel).